Recently I wrote about the potential reluctance  of construction workers and contractors to surrender their pickups and panel trucks to the automated trucks that are likely to enter the market over the next few years. Because of the impact of the autonomous vehicles on the construction industry and on our cities and infrastructure as well, we want to give you a bit of an overview of the current status of the technology, the manufacturers, the government rules and regulations that are being developed and give you another peek into the future, a near future that is in flux as we speak, but one that is as inevitable as perhaps those two immutable actions, death and taxes. Well taxes at least. So that you are aware, there are autonomous vehicles ranging from sedans to minivans to buses, cement trucks, excavators and other vehicles that are being tested and used in countries all over the globe today. This no longer science fiction or some kids playing games, these vehicles are on the roads today. There currently are a dozen or so of your favorite auto companies who are collaborating with your favorite IT companies to develop the software necessary to drive those vehicles at 6 different levels of control. Level 0 – The human driver does all the driving. Level 1- An advanced driver assistance system (ADAS) on the vehicle can sometimes assist the human driver with either steering or braking, but not both simultaneously. Level 2 – An Advanced driver assistance system (ADAS) on the vehicle can itself actually control both steering and braking/accelerating simultaneously under some circumstances. The human driver must continue to pay full attention (“monitor the driving environment”) at all times and perform the rest of the driving task. Level 3 – An Automated Driving System (ADS) on the vehicle can itself perform all aspects of the driving task under some circumstances. In those circumstances, the human driver must be ready to take back control at any time when the ADS requests the human driver to do so. In all other circumstances, the human driver performs the driving task. Level 4 – An Automated Driving System (ADS) on the vehicle can itself perform all driving tasks and monitor the driving environment- essentially, do all the driving – in certain circumstances. The human need not pay attention in those circumstances. Level 5 – An automated Driving System (ADS) on the vehicle can do all the driving in all circumstances. The human occupants are just passengers and need never be involved in driving. Arizona, California, Florida, Louisiana, Michigan, Nevada, North Dakota, Tennessee, Utah, Virginia and Washington, DC. A picture of companie s who expect to have autonomous vehicles  in production in the next three to five years include: Apple, Intel/Mobileye, Fiat-Chrysler, Ford, GM, Audi, BMW, Mercedes Benz, Volvo, Waymo, Tesla, Volkswagen, Uber, Baidu, nuTonomy-Singapore, Huawei, Stagecoach, Samsung, Bosch and Five AI. We would encourage contractors across the country to make themselves aware of the impact that these vehicles will have on the design, construction and operation of the buildings and infrastructure that we build every day in this country. The DOT is developing a set of guidelines  for these vehicles, but they seem to be playing catch up to the companies already testing their prototypes on our roads and highways in the country. There is another dimension to these vehicles that we have not mentioned. The Internet of Things (IOT) will quickly enable all new vehicles on the road to talk to each other, to interact with the highways and infrastructure where they drive and park and that will accelerate the adoption and safety of our entire transportation system in the country. 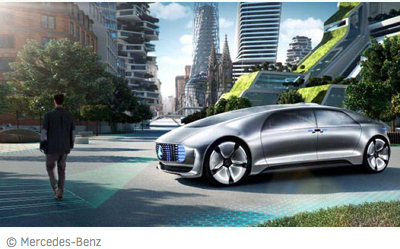 You can expect that autonomous vehicles will change the way you build in the near future.